normally a quiet wilderness area begins to come to life with cruisers looking for the perfect anchorage. Last year my family and I spent nearly a month in the North Channel visiting sleepy ports, rugged islands and one of the world’s largest freshwater fjords. The 1,000-mile round trip from our homeport of Grand Haven, Michigan, also allowed us to experience gunkholing at its best. Our all-time favorite anchorage is now a tiny gunkhole we found on the south side of South Benjamin Island. Here a narrow channel snakes through a granite landscape into two fabulous coves. There’s only room for one or two boats in each hole, and we were fortunate enough to find one open in peak season. Once we secured our boat, we spent several days doing nothing but taking in the beauty and solitude around us. Each day we picked our fill of blueberries, scrambled over boulders worthy of a moonscape, swam in the clear blue water, and generally fell into rhythm with nature. All of this was made possible by the security, seclusion and close confines of our gunkhole. Every cruiser has searched for perfect out-of-the-way little spots like this. Such gunkholes often involve coping with shallow water, a tight entrance and confined anchoring space. But challenging navigation and boathandling are the price paid for getting to enjoy such a fine private anchorage. While the best gunkholes are often not covered in guidebooks, with some diligent searching, close examination of charts and questioning of other cruisers, you can find great spots to explore along almost any coast. Areas like Lake Huron’s North Channel, the Chesapeake Bay, the coast of Maine, Washington State’s San Juan Islands, the Bahamas, the Florida Keys and many others are all well known for their plethora of gunkholes. Once you’ve located a potential gunkhole, you can minimize navigation risks by first anchoring outside and using your dinghy to survey a narrow, shallow or otherwise tricky entrance. Modern charts, electronic or otherwise, may not accurately represent tight coves and their entrances, so it is wise to gather your own data and check for adequate water depth for both entry and anchoring. Tech-savvy gunkholers carry handheld depthsounders in their dinghy’s gear bag for such occasions. 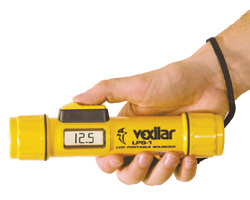 Handheld sonar units are relatively inexpensive and are typically about the size of a flashlight. I personally carry NorCross Marine’s Hawkeye H22PX and use it often in gunkholes, as well as in unfamiliar passes, bays and backwaters. If you’re a low-tech cruiser, you can use a leadline, which is simply a long piece of line with a weight on the end that is marked at measured intervals. To take soundings, drop the weight overboard, take up slack in the line when it touches bottom, and then note which depth marker on the line is nearest the water’s surface. The weight on a traditional lead line (called a “plummet” or “plumb bob”) will have a hollow tip that can be filled with tallow, peanut butter or some other sticky substance. This allows you to sample the bottom and get an idea of the holding ground in the area. Mud or sand normally indicates the best holding, loose shells and small stones may or may not indicate good holding, and an empty lead may indicate large rocks or grass, which may provide poor holding. In addition to sounding the entrance, you should also sound likely anchoring spots, taking care to make notes if the gunkhole is complicated. Look for natural ranges where objects in the foreground and background line up along a favored line of approach. Note any hazards such as submerged logs, boulders and ledges. If necessary, you might even set a series of small floats on weighted lines to serve as nav buoys to help guide you in. Having surveyed the gunkhole’s entrance and anchorage, you can then decide whether to go in with your sailboat. Don’t forget to factor in tidal effects if they are present. As a rule, it is best to enter and explore any gunkhole on a rising rather than falling tide, so you can get off easily if you run aground. Once inside a gunkhole with your sailboat, you may need to get creative when anchoring to deal with poor holding ground or a lack of space. It may well be necessary to use a short scope on the anchor rode. You may not have the swinging room to lay out the recommended 7:1 scope and may have to settle for something like 3:1 instead. If your gunkhole is well protected with good holding this probably won’t create problems. If necessary you can compensate for the lack of scope by setting another anchor or by taking one or more lines to shore. These lines should be rigged at one end of the boat with the anchor at the other holding the boat in deeper water so it won’t go aground. It is easiest to set the anchor first and then carry one or more lines to shore in your dinghy. If you don’t have a dinghy, look for a steep-to shoreline that will allow you to set a crewmember with lines ashore from the bow. Be especially cautious if you’re setting a stern anchor and bringing the bow to shore, as the rode for the anchor will be paid out closer to the prop and rudder than usual. Lines taken ashore can be secured around trees or boulders. While cruising in the North Channel last summer, I found several large granite boulders that had mountain climbing pitons and iron rings affixed to them, which were very convenient for tying off lines. While I don’t condone permanently altering an anchorage just to secure lines to shore, I do advise being creative and taking advantage of your surroundings. When tying off to trees, take care not to damage them. A few cruisers I met in the North Channel carried scrap pieces of carpet to use as chafing gear. These, or something similar, like flexible hoses, can be used to prevent your lines from harming trees, or to prevent rocks from harming your lines. Keep in mind that you may need 100 feet or more of line to reach a suitable tree or boulder. You may also need multiple lines. Windy conditions in a tight gunkhole may require you to secure your boat in a web of lines. If one side of the boat is closer to shore than the other, an anchor set from amidships can help hold the boat off the rocks. If the shoreline is very steep (nearly vertical), you may be able to tie directly to shore, as you would a dock, using multiple fenders to protect your hull. Again, a midships anchor can be set to hold you off your “rock dock.” Once all the lines are set, you can adjust the line tension so your boat is perfectly positioned. If done correctly, you’ll feel like you’ve just leased a transient slip in nature’s preeminent marina. If other boats are already secured inside your gunkhole, you must consider what technique they’ve chosen to secure themselves. One boat swinging freely at anchor with another tethered in place with lines to shore can lead to collisions if the wind or current should shift. Obviously if all boats in a gunkhole are tethered to shore there is no danger of colliding. Likewise, if each boat is swinging freely at anchor, there must be room for them to swing together. You want to be sure there is space between the boats and that all boats are anchored on the same sort of rode. A boat anchored on chain rode will swing much less freely than a boat anchored on rope. Gunkholing is all about exploration. Some creative seamanship and boathandling can go a long way toward opening up new cruising grounds and anchorages. Don’t be afraid to explore new areas. If you’re prepared to do a little extra work and employ some unconventional techniques, you’ll enjoy some very memorable new anchorages and lots of peaceful solitude. Study charts to determine possible gunkhole locations. Look for small coves, narrow channels or rivers and hidden backwaters. The best gunkholes will have deeper water hidden behind a shallow entrance or some other choke point. In tidal areas look for spots that can be entered only on a flood tide. Look for a hole that provides protection from prevailing winds and currents. Consider how exposed you’ll be if there is a dramatic change in weather and wind direction. Look for back-up anchorages in case you have to evacuate a tenuous gunkhole on short notice. If there’s not enough room or depth to swing at anchor, look for stout trees and suitable boulders for securing lines. Is there enough room to set more than one anchor? Carry the proper equipment, including up-to-date charts, a handheld depthsounder or leadline, multiple lines 100ft or more in length, extra anchors and chafe protection. To discover secret gunkholes, talk to local cruisers and mariners about areas not covered in guidebooks.